NOTE: To avoid damaging the printer, always remove misfed media carefully, without tearing it. Try to remove the paper in the direction that the paper would normally feed. Any piece of media left in the printer, whether large or small, can obstruct the media path and cause further misfeeds. Do not reload media that has misfed. Check the jam message on the Touch Screen before opening the paper tray. If there is a paper jam inside the printer, clear the jam inside the printer first. 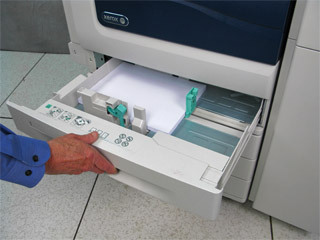 Pull out the paper tray where the paper jam occurred. Remove any jammed paper. 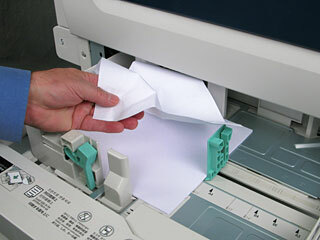 If paper is torn, remove the tray completely and check inside the printer for torn pieces of paper. Reload the tray with undamaged paper, and make sure the paper edge guides are positioned correctly against the paper. Push the tray in until it stops. Select the [Change Settings] button. Select the correct size, type and color.